Republican and Democratic senators agreed Thursday that they need to extend funding for the Children's Health Insurance Program, which covers 8.4 million low- and moderate-income children. "If Congress doesn't act to provide additional federal funding, a number of children who would likely be eligible for CHIP will go uninsured once federal funding is exhausted," said committee Chairman Orrin Hatch (R-Utah) in a written opening statement. He co-authored the original CHIP legislation with former Democratic Sen. Ted Kennedy 20 years ago. Partisan differences over the details and duration of funding could delay congressional action to keep dollars flowing to the states for the popular $15 billion program. That could force many states, which soon will exhaust their federal allotments, to start winding down the program over the next few weeks or months. Four states, including California and Arizona, will spend all their federal dollars by December, while 27 more will run out of money by March. "The states have held off making changes to their programs because they didn't want to alarm beneficiaries or cause disruption for health plans and providers," Anne Schwartz, executive director of the Medicaid and CHIP Payment and Access Commission, told the senators. "But the clock is very close to having run out." MACPAC recommended last December that Congress reauthorize funding for five years through 2022. Schwartz said a longer authorization is needed because of the political uncertainty surrounding health insurance markets as Republicans push to roll back Medicaid and Affordable Care Act coverage. MACPAC projects that 1.2 million children would become uninsured if CHIP funding ends, because their families would not be able to afford premiums or cost sharing under private insurance. Since CHIP started in 1997, the uninsured rate for children has plummeted from 13.9% to 4.5% in 2015. It's unclear whether Senate and House leaders will choose to move renewed CHIP funding as a standalone bill or package it with other measures, such as provisions to stabilize the individual insurance market or extensions of various Medicare programs. Packaging CHIP renewal with funding for the Affordable Care Act's cost-sharing reduction payments to insurers could help GOP leaders get the CSR funding past balky conservatives, who don't want to vote for anything that stabilizes the ACA. On the other hand, combining the measures could jeopardize rapid approval of CHIP funding, which most Republicans want to see passed. At the Thursday hearing, Republican Sens. Charles Grassley of Iowa, Dean Heller of Nevada, and Tim Scott of South Carolina strongly backed renewal of CHIP funding, along with all the Democrats on the panel. "No one wants to be accused of interfering with continuity of healthcare for kids," said Joe Antos, a conservative health policy analyst at the American Enterprise Institute, who predicts CHIP funding will probably pass as a standalone bill. Many states will have to send notices to CHIP beneficiaries, health plans and providers as soon as Dec. 1 if Congress doesn't approve renewed CHIP funding this month, Linda Nablo, chief deputy director of the Virginia Department of Medical Assistance Services, told the senators Thursday. Democrats, backed by MACPAC recommendations, want to continue enhanced federal CHIP contributions to the states authorized by the Affordable Care Act. That bumped up federal matching rates by 23 percentage points through September 2019. As a result of that increase, the feds have picked up 88% to 100% of states' costs for the program. In addition, Democrats and MACPAC want Congress to extend through 2022 an ACA provision barring states from reducing CHIP eligibility below the levels in place before the ACA took effect. But some Republicans want to end the enhanced federal match and the state maintenance-of-effort provisions. Political observers say Republicans are caught between their desire to restructure CHIP and the political imperative of quickly renewing funding. 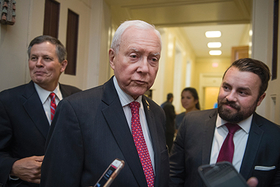 "While some policy changes are certainly in order for the program... there may not be time to give full and fair consideration to CHIP reforms prior to the expiration of federal funding..." Hatch said in his opening statement. That may prompt Republicans to push for a reauthorization lasting just a year or two, rather than the five years recommended by MACPAC. In contrast, America's Health Insurance Plans and provider and patient groups want to see CHIP funding extended for at least five years. "There are Republicans who want to make reforms to the program, but the appetite to do that in the short run probably isn't there," said Christopher Pope, a senior fellow studying health policy at the conservative-leaning Manhattan Institute. Out of the 8.4 million children covered by CHIP, an estimated two million have serious chronic conditions. The mother of one of those children, Leanna George of North Carolina, told the senators Thursday that CHIP has enabled her and her husband to pay for her son Caleb's expensive medications, medical care, and occupational therapy. "To lose CHIP would be devastating, because all the things we've done to build Caleb up we wouldn't have access to," she said. Oregon Sen. Ron Wyden, the Finance Committee's senior Democrat, said Republicans and Democrats have an obligation to come together to fund health coverage for children, just as Sens. Hatch and Kennedy worked across the aisle 20 years ago to create the program. "Kids deserve the very best," he said. "We have to make sure CHIP is way way way up our priority list and doesn't get short shrift." Correction: The Affordable Care Act bumped up federal matching rates for CHIP funding by 23 percentage points through September 2019. The story originally misstated the level of the matching rates.